Yams and sweet potatoes are loaded with Vitamin B6 & C and other health benefits and so I try to incorporate them in my cooking whenever possible. 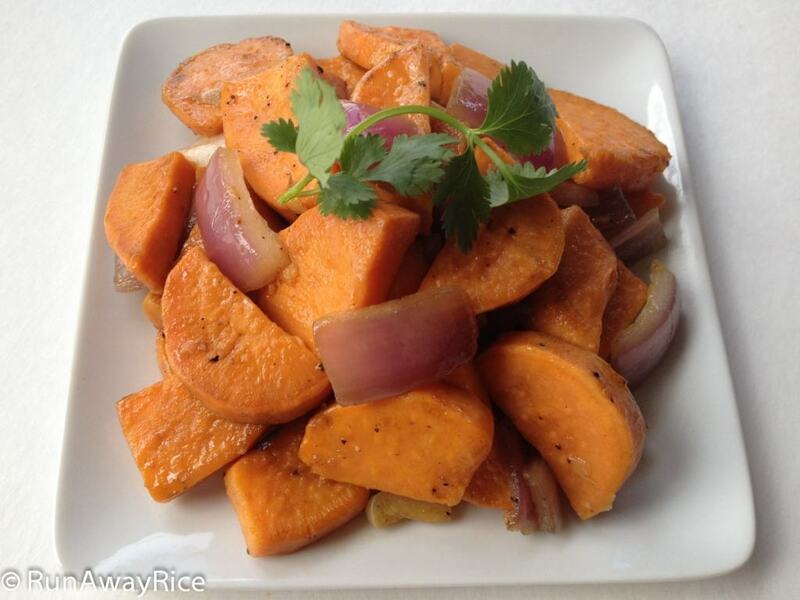 I had some leftover yams and combined it with my go-to stir-fry recipe to make this delicious Yam Hash dish. Simple and quick to make, this is a wonderful side dish to any meal. Fill a bowl with water. Add 1 teaspoon of salt and stir to dissolve. Peel the yams and slice into small 1/2-inch thick chunks. Add yams into water bowl and soak for 5 minutes. (This prevents the yams from turning brown as they oxidize very quickly.) Drain. Layer yams on a large plate and microwave on High for 4 minutes. Yams should be about half-way cooked at this point. Peel and dice the onions. Heat a wok over Medium High heat. Add the oil, onions and garlic. Stir fry for 1-2 minutes, until fragrant. Add the yams and stir-fry for 3 minutes. Add the oyster sauce, soy sauce and ground black pepper. Stir-fry for another 2-3 minutes.